Through style coaching, closet edits and shopping, I collaborate with each client to find their personal style from the inside out. My goal is to make dressing enjoyable and easy, and to help clients use style as a vehicle for self empowerment and expression. 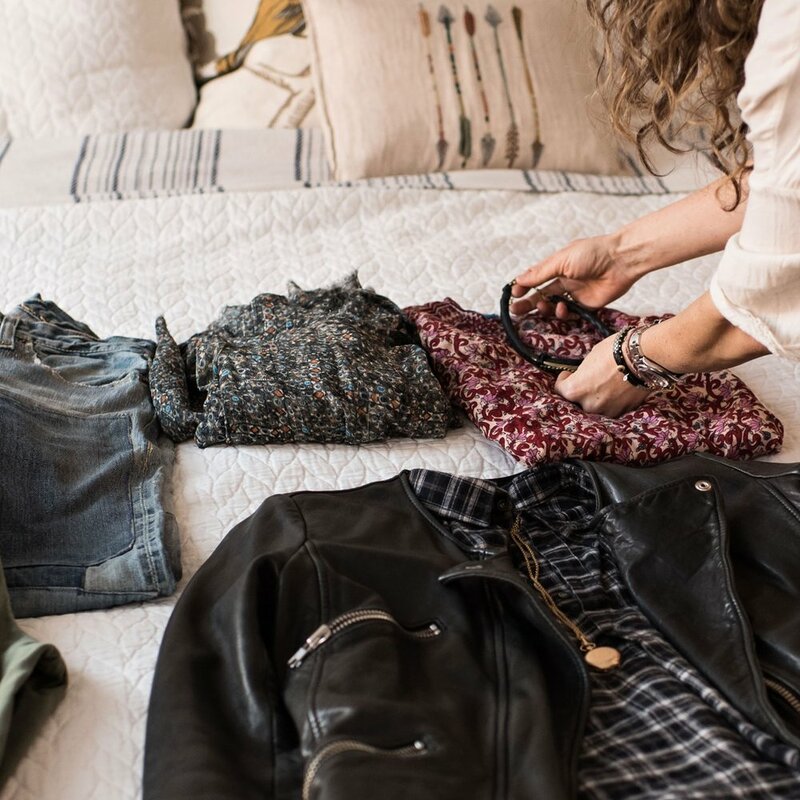 A personalized closet edit gives me a chance to analyze your current wardrobe, identify key pieces you may be missing and help get a sense of who you are. I will be able to give you a better understanding of how to work with what you already have and build a solid foundation to work with for your future purchases. Based on your individual needs and style goals I will create an itinerary to shop throughout NYC. I will pre shop for you, meaning all the pieces that I think will best suit you will be set aside in your sizes waiting for you to arrive. Together we can create your best looks and I can advise on how to incorporate your new pieces into your existing wardrobe. For clients overwhelmed by the prospect of finding time to shop, I will bring the market to you. We will meet briefly beforehand to asses your needs budget and sizes. I will bring pieces to you where you can try them on in the privacy and comfort of your own home. Even people who have lived their entire lives in NYC discover incredible places to shop throughout this city. Completely tailored to your goals, we visit the most popular shopping areas in NYC or explore some of the best kept secrets in hidden corners of Brooklyn. I HAD NEVER WORKED WITH A STYLIST BEFORE AND DESPERATELY NEEDED SOME GUIDANCE AS WE PLANNED OUR WEDDING... WORKING WITH JOCELYN WAS THE BEST DECISION WE COULD HAVE MADE! HER SENSE OF STYLE IS COOL WITHOUT BEING OVERLY TRENDY, SOPHISTICATED AND CLASSIC, AND SHE HELPS YOU AVOID CHEESY BRIDAL MISTAKES AND KEEP IT CLASSY/SIMPLE. SHE KNOWS WHAT TO SPLURGE ON AND WHAT TRAPS TO AVOID. SHE IS PATIENT AND GENTLE BUT WILL NOT HESITATE TO GIVE HER OPINION IN A SUPER USEFUL WAY. SHE HELPED US CHOOSE OUR FLOWER GIRL DRESSES, RING BEARER SUIT, GROOMSMEN TIES, REHEARSAL DINNER ATTIRE, AND WEDDING ACCESSORIES, AND SHE CAME WITH ME TO MY BRIDAL GOWN APPOINTMENTS AT KLEINFELD TO ENSURE THE LOOK WOULD BE FRESH, MODERN, FLATTERING & TIMELESS. THE RESULTS WERE ABSOLUTELY FLAWLESS AND I COULDN’T BE HAPPIER! JOCELYN TRANSFORMED MY WARDROBE NEARLY OVERNIGHT AND, IN DOING SO, GAVE ME AN INCREDIBLY REFRESHING CONFIDENCE BOOST. I’VE ALWAYS LOVED FASHION AND CLOTHES BUT AFTER HAVING KIDS, I WOKE UP ONE DAY AND THEN THE NEXT WITH OUTDATED AND OVER-WORN ITEMS THAT NO LONGER FIT OR WERE NO LONGER APPROPRIATE. JOCELYN MADE ME FEEL COMPLETELY COMFORTABLE DURING MY CLOSET EDIT AND THEN TOOK ME SHOPPING TO STORES IN LINE WITH THE PRICE AND STYLE I WAS LOOKING FOR. SHE QUICKLY FOUND CLOTHES THAT FIT ME, AND FIT WHAT I ENVISIONED FOR MYSELF.